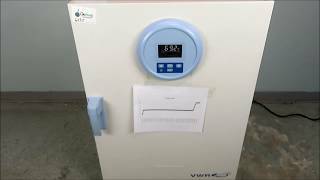 The VWR Forced Air incubator offers you a uniform chamber temperature controlled by digital precision. This 6.3 cu ft lab incubator has a polished stainless interior with coved corners for easy cleaning and removable shelving that holds up to 55lbs each and an access port for peripheral instrumentation. The forced air nature of this laboratory incubator heats quickly to 37°C in just 30 minutes and makes it an ideal choice for applications involving microbiology and research, as well as drying applications. The easy to use, upfront digital control of this forced air incubator has a bright LED screen that allows you to program your desired temperature, between Ambient +10°C - 75°C, as well as the flexibility of choosing your start and stop time. To protect samples, there is a dual safety sensor and overtemperature alarm to alert users to changes in conditions, and the Forced Air incubator can be connected to a PC for data monitoring through a RS232 connection. Users of the VWR incubator can monitor sample progress easily through the tempered glass door, built to maintain the environment while providing a clear view. This VWR Forced Air Incubator is new crate, but has been tested by our service team with clean bill of health as part of our QC Process. All of our lab equipment comes backed with our standard warranty. Should you have any questions about this or any of our other incubators, please don't hesitate to contact us, please don't hesitate to contact us.